Jasmine Moody, a 22-year old Texas Women’s University student mysteriously vanished on December 4, 2014, while visiting a friend in Detroit, Michigan. Nearly four years later, police are no closer to figuring out what happened to her. News coverage of her disappearance has long since vanished from the scene too, folding into the phenomenon of what is known as Missing White Woman Syndrome. 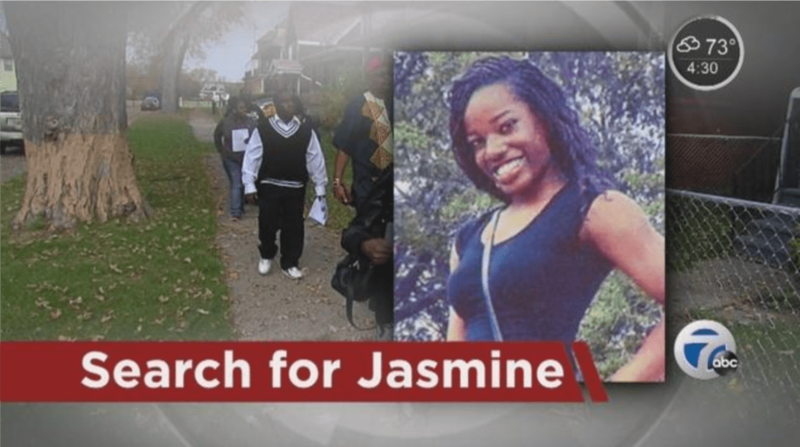 Approximately 7:30 p.m., the evening of December 4th, Jasmine was last seen leaving her friend’s home in the vicinity of the 3700 block of Baldwin, in the Van Dyke and Mack area of Detroit. Her family, who lives in Texas, is convinced foul play is involved in Jasmine’s disappearance and disappointed in the police department’s response and ensuing investigation. Jasmine had known she wanted to be a nurse since she was 16 and described as a well-rounded student at Texas Woman’s University. According to her stepfather Patrick Kidd, Jasmine was a straight-A student, danced, and was training to be part of the U.S. Armed Forces through her school’s ROTC program. According to police, Jasmine had developed an online relationship with Brittany Gurley, a woman who lived in Detroit. Just a few months after meeting online, Jasmine and Brittany had developed a strong friendship and Jasmine flew to visit Brittany and her family for Thanksgiving. On the evening of December 4th, the two women allegedly got into an argument about Jasmine’s social media posts. Brittany and her family would later tell police that Jasmine put on a hoodie and walked out of the house. Little else is known about her disappearance. No major ground search was conducted, and ongoing media exposure on a national level has been minimal. 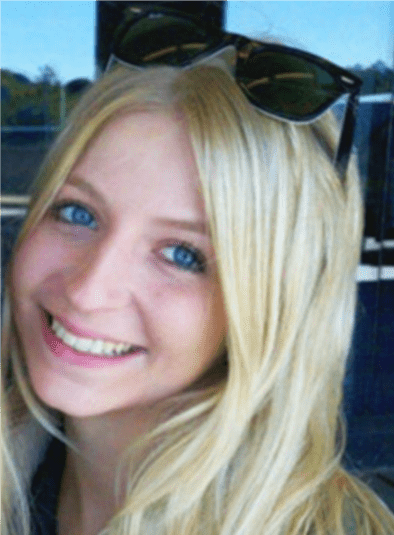 In contrast to Jasmine Moody’s case, Lauren Spierer, a 20-year old student at Indiana University, vanished June 3, 2011, after an evening out with friends in Bloomington, Indiana. Lauren, who grew up in Scarsdale, an affluent town in Westchester, New York. Her disappearance quickly garnered national press attention but remains unsolved. After an evening out at Kilroy’s Sports Bar with friends, Lauren was last seen on 11th Street and College Avenue in Bloomington at approximately 4:15 a.m. She had left her cell phone and shoes at the bar, presumedly taking her shoes off in the beach-themed bar’s sand-filled courtyard. 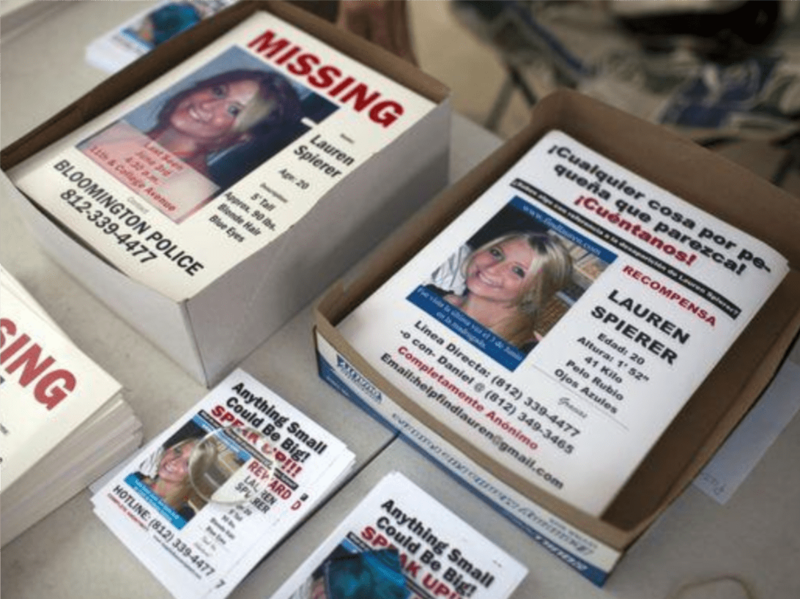 National news quickly began covering Lauren’s disappearance while hundreds of volunteers assembled to distribute thousands of fliers and help conduct ground searches of the area. A billboard overlooking the Indiana State Fairgrounds, along Fall Creek Parkway, asks the public for any information that would lead to the whereabouts of Lauren. Hundreds of volunteers continued to turn out daily to help the family in their search. Lauren’s case was profiled on popular America’s Most Wanted in 2011, leading to dozens of leads but not that one the family needed. Over the years, dozens of news media outlets have covered Lauren’s story. Early on, Lauren’s parents hired private investigators and today, maintain an active Facebook group. Every day Lauren’s family simply hopes for answers. That’s all any family of a missing person could ask for. Two young women, one black, one white, both ambitious students couldn’t be treated more differently by the media. One becomes nearly a household name, the other nearly forgotten. With absolute certainty, no one can say exactly why. As of May 31, 2018, there were 87,608 active missing person cases in the National Crime Information Center (NCIC) database at the Federal Bureau of Investigation. 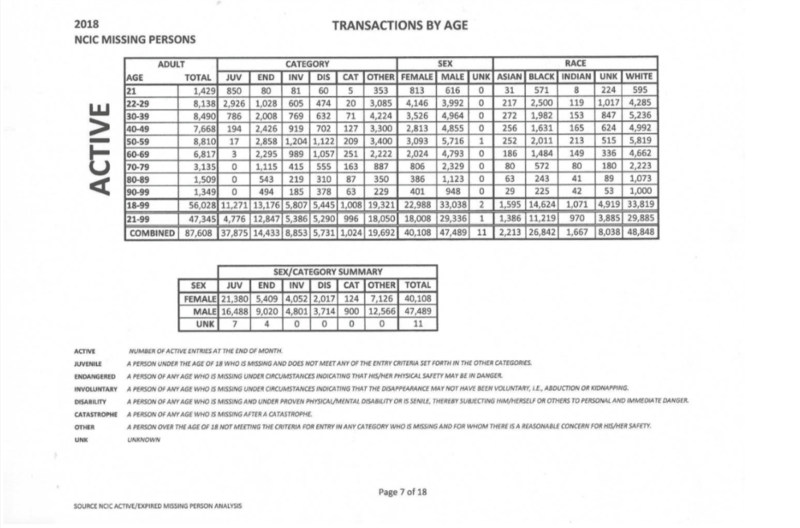 Of the active missing person cases listed in NCIC, 40,108 cases are of missing women and 26,842 are black. Names like Chandra Levy, Laci Peterson, Elizabeth Smart, Polly Klaas, Natalie Holloway and Lauren Spierer have become familiar household names. Their missing person cases have dominated the headlines over the years. Cases like Jasmine Moody’s are not rare and unfortunately rarely make the local news. Historically, whenever a female missing person becomes a national headline, she is almost certain to be a pretty, young white woman. When was the last time you heard of a missing black female on CNN or other national news outlets? Some say the cases fit a narrative pattern that storytellers have used for more than a century, a pattern who design still incorporates remnants of an outmoded view of women and black people and their roles in society. Regardless of class, color or age, it is clear that there is disproportionate coverage of black missing person cases. Referred to as “Missing White Woman Syndrome” and has led to a number of tough on crime measures named after white women who disappeared such as Suzanne’s Law, Kristen’s Law, Jennifer’s Law, Amber Alert and others. In a study conducted by Baylor University, “The Invisible Damsel: Differences in How National Media Outlets Framed the Coverage of Missing Black and White Women in the Mid-2000s,” Professors Moody, Dorris and Blackwell concluded that in addition to race and class, factors such as supposed attractiveness, body size, and youthfulness function as unfair criteria in determining newsworthiness in the national news coverage of missing women. In addition, news coverage of missing black women was more likely to focus on the victim’s problems, such as abusive relationships, a troubled past, while coverage of white women tends to focus on roles as mothers or daughters. Zach Somers, a sociologist at Northwestern University, noted that while there has been extensive research that shows that white people are more likely than people of color to appear in news coverage as victims of violent crime, there is relatively none when it comes to missing person cases. Others have blamed “police brutality” for the lack of publicity given to black female missing persons, attributing the silence to a habit of “sexism and patriarchy” in American society. One group is fighting the imbalance of national media exposure that exists. The Black and Missing Foundation’s mission is to draw more attention to missing African Americans by providing an outlet for spreading the word through technology and print – and their work is making a difference. By creating relationships with the media, government agencies, and the public, they are increasing the chances of missing black women being covered in the news and ultimately, to bring them home. Derica and Natalie Wilson, two sisters-in-law, and founders of the Black and Missing Foundation have been profiled in People Magazine, Essence, Ebony, Huffington Post, Washington Post and developed a partnership with TV One. This year they celebrate ten years, helping thousands of families of missing persons and finding nearly 300 people. Black and Missing Foundation have set the example for other groups to follow, especially the media. Finding missing persons is a cooperative effort between the police, media, social service agencies and especially the public. With every news story, the coverage generates leads and increases the chance of that one lead being reported that will assist law enforcement in the investigation, and even close a case. When it comes to missing persons there is no black and white, there are only families who are missing their daughters, siblings missing their sisters, children who are missing their mothers. There is no rich or poor, only families, human beings experiencing the most traumatic experience of their lifetimes. People . . . who need our help. For more of Kym Pasqualini’s work in missing persons, please visit her website, Missing Leads , or log on to Facebook and join the conversation on the Missing Leads Discusssion page!